The U.N. Security Council unanimously approved new, strict sanctions on North Korea on Friday, the day after the diplomatic body rejected President Donald Trump’s demands that it recognize Jerusalem as Israel’s capital. In November, North Korea conducted its most significant missile test to date, launching an intercontinental ballistic missile that could be capable of landing nuclear weapons anywhere in the continental United States. The new, U.S.-drafted sanctions include drastically cutting the amount of oil that the hermit state can import by nearly 90 percent, forcing all North Koreans working outside of their country to return home within a year, and prohibit the export of any industrial equipment to the country. The sanctions are all meant to sharply limit the income of North Korean leader Kim Jong Un’s regime, with the ultimate hope of preventing them from producing an operational nuclear arsenal. Still, the sanctions don’t go quite as far as the Trump administration had hoped they would: They don’t allow other countries to hail and board North Korean ships, which the U.S. had hoped they would. More than 200 journalists were targeted by a Russian hacking group known as Fancy Bear, the same hackers notorious for stealing the emails of Hillary Clinton’s campaign chairman John Podesta, according to Associated Press. Using data from cybersecurity firm SecureWorks, the AP investigation revealed journalists were the third-largest group targeted by the Russian hacking squad in its three-years long cyber campaign. The hackers sent fake emails resembling a Google Accounts Team telling users there had been an unusual sign-in attempt and that users had to click on a link to review. Some phishing emails were sent by the hackers as early as several months ago. The hackers targeted well-known journalists, including Ellen Barry, the former Moscow bureau chief for The New York Times, the New Yorker’s investigative reporter Adrian Chen, and Josh Rogin, now an opinion columnist for the Washington Post. About a quarter of the targeted journalists worked for the New York Times, while another quarter were Moscow-based foreign correspondents or local Russian reporters, according to the AP. The Daily Beast said four of its former and current reporters were among those targeted. Fancy Bear did not limit its resources to Podesta and journalists, however. In November AP reported that the group also attempted to hack the Secretary of State’s, several U.S. defense contractors, and even some Ukrainian officials. 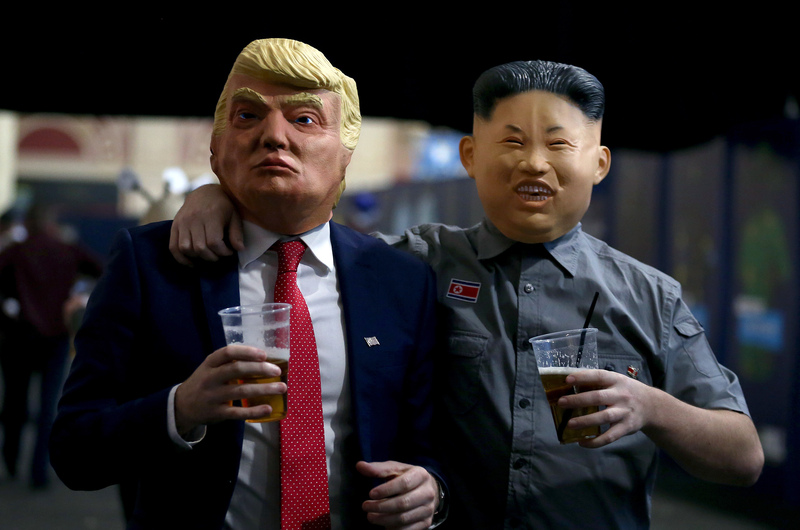 Fans dressed as Donald Trump and Kim Jong Un during Day 3 of the William Hill World Darts Championship at Alexandra Palace, London, Dec. 16, 2017. Donald Trump is seeking "the total subordination of the whole world" with his new national security strategy, North Korea warned Friday, according to Reuters. Unveiled by the White House Monday, the document floated the use of "overwhelming force" to end Pyongyang's nuclear ambition — a “criminal” enterprise, according to North Korean state media. A spokesman for the foreign ministry in Pyongyang denounced the strategy Friday as "nothing but the proclamation of aggression” and an attempt to "stifle our country and turn the entire Korean Peninsula into an outpost for seeking that hegemony." The latest drumbeat in what watchers fear is a march to war comes as the U.N. prepares another raft of sanctions against a repressive regime bent on developing a credible ICBM threat. A draft resolution that bans 90 percent of Kim Jong Un’s oil supply and forces the repatriation of all North Korean nationals within 12 months is due for a Security Council vote Friday, Reuters reported. China and Russia have yet to indicate whether they’ll approve the new measures. Yemen reached another grim milestone Thursday: At least 1 million people are now believed to have cholera. The International Committee of the Red Cross announced the new estimate Thursday, warning the outbreak was "amplifying the suffering of a country caught up in a brutal war." The epidemic continues to wreak havoc on a country already mired in a civil war that’s claimed at least 8,000 lives, and a massive humanitarian crisis the U.N. has described as the worst in the world. Nearly all of Yemen’s current humanitarian problems can be traced back to the bruising two-and-a-half year civil war waged between Houthi rebels and the Saudi-led coalition fighting on behalf of President Abdrabbuh Mansour Hadi. The war has displaced at least 3 million people, while an expansive blockade administered by Saudi Arabia has left millions of Yemen’s most vulnerable living without food, aid or fuel. In total, at least 18 million people in the country currently rely on some form of humanitarian aid. Saudi Arabia finally agreed to loosen its military blockade in late November after the U.N. warned the impoverished country would collapse into "the largest famine the world has seen for many decades" if it remained. The Saudi-led coalition has continued to ease its blockade in December, agreeing to re-open the key port of Hodeidah Thursday. Blocking access to that one port deprived aid to as much as 70 percent of those in need. More than 2,000 people have reportedly succumbed to cholera since the disease broke out in April. Health officials say the outbreak was entirely preventable, exacerbated by factors including the Saudi-led blockade and a vulnerable medical infrastructure decimated by the war. Another North Korean border guard defected to South Korea across the demilitarized zone Thursday, the low ranking soldier enjoying a much easier crossing than his former comrade who defected five weeks ago. The soldier was stationed at a guard post along the DMZ when he escaped under the cover of thick fog just after 8.00 a.m. local time, the South Korean military’s Joint Chiefs of Staff said. Unlike the defection on Nov. 13, the man escaped without being shot, although gunfire was reported during an ensuing cross-border confrontation. More than an hour after the soldier’s crossing, South Korean guards fired warning shots as North Korean troops approached the demarcation line looking for their missing colleague; gunshots were later heard from the northern side of the border, authorities in Seoul said. The North Korean defector is currently in military custody, South Korean military officials said. Spokesman Roh Jae-cheon told reporters that surveillance equipment alerted South Korean troops to his movements, despite fog limiting visibility to about 100 meters. The escapee is the fourth North Korean soldier to defect to the south in 2017 – the same number reported in the previous five years all together. A more dramatic escape occurred in November, when an army staff sergeant tried to reach the border in a jeep. Video of the incident showed the man fleeing on foot after his vehicle got stuck in a ditch, and being repeatedly shot by his comrades. About 30,000 North Koreans have defected to South Korea since the end of the Korean War, with the majority coming via China. 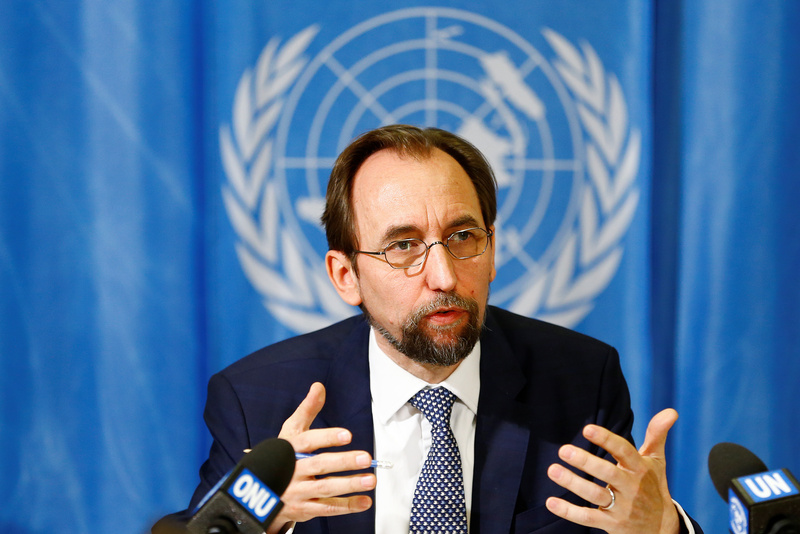 UN Human Rights Chief is leaving, cites “appalling” reality for "the people we serve"
The UN’s top human rights officer, Zeid Ra’ad al-Hussein, said he will not be running for a second term, citing a political climate incompatible with human rights advocacy. Al-Hussein, a Jordanian prince, informed his staff that he intends to step down after his four year term expires, according to an email seen by Foreign Policy. Al-Hussein said he did not feel he could speak freely in today’s political climate. Al-Hussein has been especially critical of the Trump administration, specifically the president’s treatment of journalists, as well as Russia for its occupation of Crimea and its role in Syria. Al-Hussein also warned previously of the “growing disarray” in many countries and the “erosion” of human rights across the world. “There are many months ahead of us: months of struggle, perhaps, and even grief — because although the past year has been arduous for many of us, it has been appalling for many of the people we serve,” al-Hussein wrote in his email. Communist rebels in the Philippines got an early Christmas present Wednesday when President Rodrigo Duterte declared a 10-day unilateral ceasefire to ensure a “stress-free” holiday season. Wary that the decadeslong Maoist insurgency could spoil the festivities, Duterte ordered the military and police to halt their offensive against the rebels from Dec. 24 to Jan. 2. “I do not want to add more strain to what people are now suffering,” the 72-year-old told reporters Wednesday. He said Duterte expected the Communist Party of the Philippines, which has been waging a guerrilla war against the state since the late 1960s, would reciprocate by suspending operations in “a similar gesture of goodwill.” Rebel leaders have not yet responded. Since coming to office last year, Duterte has pushed for peace with the communists, but called talks off last month in response to fresh attacks by the rebels’ armed wing, the New People’s Army, who have been targeting companies demanding payments to finance their operations. Duterte then declared the force a terror organization, and ordered the arrest of rebel leaders who had been temporarily freed for peace talks. The conflict with the insurgents, whose senior leadership is based in the Netherlands and whose ranks are believed to number about 3,000, has killed at least 40,000 people. Japan is bolstering its missile defense with an American-made ground-based system to counter the threat of North Korean rockets, Defense Minister Itsunori Onodera told reporters Tuesday. The country’s Cabinet approved the purchase of two Aegis Ashore batteries, estimated to cost around $2 billion, which will enable it to better respond to North Korean aggression. “North Korea’s nuclear missile development poses a new level of threat to Japan, and as we have done in the past we will ensure that we are able to defend ourselves with a drastic improvement in ballistic missile defense,” Onodera said. Pyongyang has repeatedly fired intercontinental ballistic missiles toward Japan. The most recent test, on Nov. 29, featured a new type of missile that reached an altitude of more than 2,400 miles, far higher than previous efforts and well beyond the range of Japan’s existing defense shield. Japan has two existing layers of missile defense: Aegis systems deployed on warships and land-based Patriot systems. The Cabinet chose Aegis over other land-based systems such as the Terminal High Altitude Area Defense system, or THAAD, that was recently deployed in South Korea, because of its greater coverage, defense officials said. The Aegis Ashore system, manufactured by Lockheed Martin, is already running in Romania, with another deployment planned for Poland. Earlier this month, Japan announced plans to buy medium-range cruise missiles it could fire from fighter jets to deter a North Korean attack. Japan’s growing militarization is controversial because it runs counter to a pacifist clause in the country’s postwar constitution, which Prime Minister Shinzo Abe has pledged to revise. That’s how long a court in Greece just sentenced one man for smuggling in migrants over the Turkish border from Iraq and Syria. The court in the coastal city of Thessaloniki found a 54-year-old Greek man guilty of running a smuggling ring that funneled more than 500 refugees into Europe in 2015 and 2016, the Associated Press reported. Europe has scrambled to find a solution to its refugee crisis, which has been fueled by conflict and instability in Syria, Afghanistan, and elsewhere. Well over a million migrants and refugees entered Europe at the peak of the influx in 2015, a year when Germany received almost half-a-million applications for asylum alone. While the number of refugees has fallen since then — only 178,000 have arrived in Europe so far this year as of mid-December, according to the International Organization for Migration — Europe is still struggling to respond effectively to the tidal wave of newcomers. 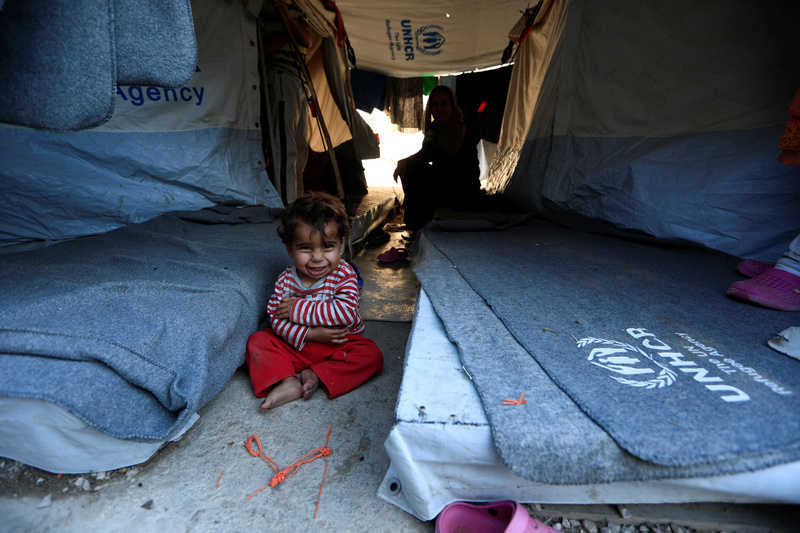 A one-year-old girl smiles as she sits with her mother at the Souda Refugee Camp in Chios island, Greece, June 10, 2017. Greece, once the focal point of the crisis, is now in distant second place after Italy, which received over 75 percent of migrants and refugees entering Europe in 2017 as of mid-September, according to IOM figures. Despite the ridiculously long sentence, the smuggler may not actually end his days in jail. Greek law limits any prison term to a maximum 25 years, no matter the sentence. Anti-Islam Dutch politician Geert Wilders called on European countries to adopt Trump-style Muslim travel bans and to build border walls to reduce Muslim immigration at a far-right conference this weekend. 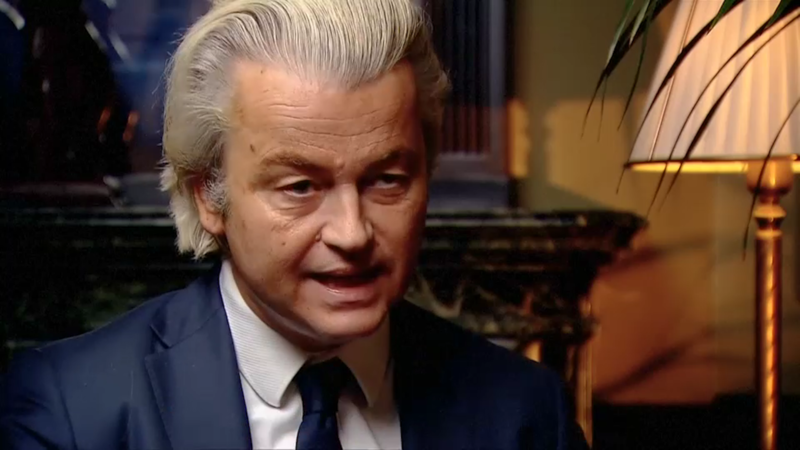 In his address, Wilders, the leader of the Dutch Party for Freedom, said European countries must resist a wave of mass immigration from Muslim countries or risk losing their “Judeo-Christian and humanist identity." “We must have the courage to introduce travel bans, as President Trump has done in the U.S. We must have the courage to send every boat with illegal migrants back, as Australia is doing,” he said. The conference was the annual gathering of the parties of the right-wing populist “Europe of Nations and Freedom” bloc in the European Parliament, which also includes France’s National Front, the Freedom Party of Austria, Alternative for Germany, and Italy’s Northern League, among others. Speaking Sunday, the National Front’s Marine Le Pen said that the parties were united in their belief that the European Union was a “catastrophic, disastrous organization” and responsible for “unbearable” migration flows into member states. It’s been an underwhelming year for the bloc, with high-profile anti-immigration populists Wilders and Le Pen both failing to perform as expected in their respective national elections. But the mood in Prague was buoyed by the news Friday that the Freedom Party of Austria had signed a coalition deal with the conservative People’s Party, making it the only far-right party in government in western Europe. Left-wing protesters demonstrated against the conference, amid fears that a surge of right-wing populism has reshaped the political landscape in the Czech Republic. “We have already declared East Jerusalem as the capital of the Palestinian state, but we haven't been able to open our embassy there because Jerusalem is currently under occupation,” he told members of his AK Party in the southern province of Karaman. Recep Tayyip Erdogan hit back Sunday at the U.S. move to recognize Jerusalem as the capital of Israel, announcing plans to move Turkey’s embassy to East Jerusalem in direct response. 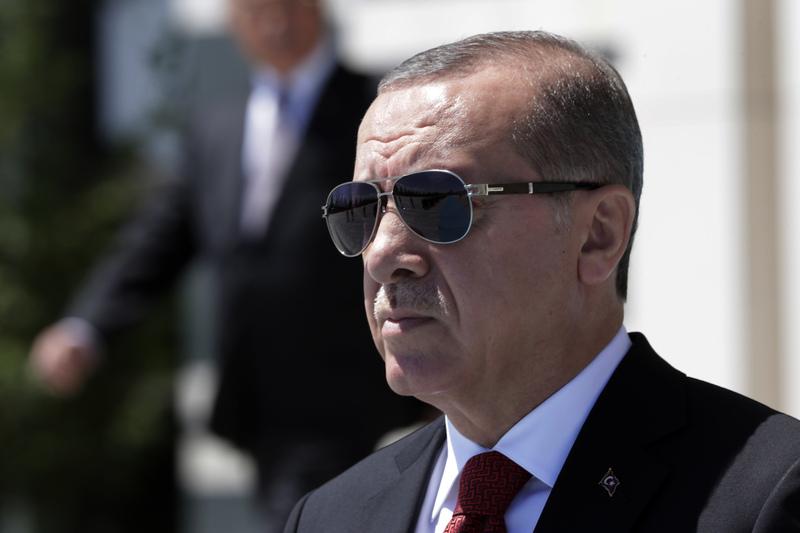 The Turkish President offered no detail as to how he would relocate the embassy as Israel controls the whole city, though Ankara does currently have a Consulate General in Jerusalem. “We have already declared East Jerusalem as the capital of the Palestinian state, but we haven’t been able to open our embassy there because Jerusalem is currently under occupation,” he told members of his AK Party in the southern province of Karaman. “But God willing, the day is close when officially, with God’s permission, we can open our embassy in East Jerusalem,” Erdogan added. The announcement came days after Turkey hosted an emergency summit of leaders from 57 Muslim countries, where they recognized East Jerusalem as the occupied capital of a Palestinian state. The summit also issued a communique stating they considered Washington’s actions a declaration it was abandoning its role “as sponsor of peace” in the Middle East. Donald Trump’s shock decision on Dec. 6 to break with decades of diplomatic precedent provoked an angry response, especially across the Muslim world. The move defied a long-established international consensus that the status of the disputed city must be determined through Israeli-Palestinian peace negotiations. Israel controls all of Jerusalem, holy to Jews, Muslims and Christians alike, and considers the city its indivisible capital. The Palestinians want East Jerusalem, captured during the 1967 Six-Day War, as the capital of their future state. On Thursday, China also restated its support for an independent Palestinian state “with East Jerusalem as its capital,” the official Xinhua news agency reported.